New World, Ancient Evil! Doom has made his way to other worlds following his banishment! Are you brave enough to advance to the next level of Thunderstone? 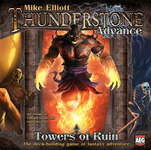 Thunderstone Advance: Towers of Ruin, which is fully compatible with all previous Thunderstone offerings, is the next stop in your adventure. In Thunderstone Advance you build your party of heroes to defeat the dreaded Thunderstone Bearers in their dungeons or wilderness. The player who defeats the most valuable monsters will win the day, but beware ? those monsters have all-new tricks up their sleeves, and victory will not come easy. Thunderstone Advance: Towers of Ruin includes new rules, all new cards in new card frames, and a new village and dungeon board. A completely revised and compatible edition of AEG's popular deck-building fantasy game set in a new game world, Thunderstone: Advance introduces over 500 new cards featuring 11 new heroes, nine new monster groups, and 19 new village cards! Plus, Familiars join the fight to aid your quest, powerful new Thunderstone Bearers lurk in every dungeon, and two dungeons offer twice the challenge! We are sorry but due to its weight and size, this game can't sent with our single item small box cheaper shipping rate.